Logins this hour: 3373 ? Log in to amion.com using your Enterprise admin password. You'll see a list of group (department) names and schedulers ( ). Additional screens let you set software options , communicate with schedulers via email and renew your license . Hover over icons to learn their function. The group list is the default page upon logging into your Enterprise Administrator account. The Site Administrator sets up and maintains the group list. Click the icon to add a new group to your list. Type the name and email of the person in charge of the schedule. Assign the admin password. It is case sensitive. The admin password assigned is the 2nd half of the password used by the scheduler to edit and publish the schedule to Amion. The 1st half of the password is the site's viewing password. For example, if the site password is 'site' and the admin password is 'schedule, the full admin password to use is 'site schedule'. The two words separated by a space. The group password is optional. Enter one if you require people to only access their own group schedule at Amion, and not see the other group's schedules. Click the icon to submit. Repeat steps 1-5 for each group schedule you need in your list. You can only add as many schedules that you purchased a license for. The number of licenses purchased appears along the top. Site administrators may wish to pay for several schedules together through an Enterprise account but omit or hide some schedules from the central "who's on" list. To hide a schedule from the central display, click on the icon to the left of the account number. Along the top, click the icon in the toolbar to hide the schedule. Schedules hidden in the central list will have the icon show up beside the post date icon. Hidden schedules are still available for viewing via the group password. To unhide a schedule, select the account to edit. Then click the icon to disable. If you need to edit the group's scheduler, change passwords, or assign the account to a different group schedule, click the icon to the left of the account number. Then update the fields needed and click to submit the changes. If you would like to inactivate an account you no longer use, select the group to edit. Then click the icon. A appears next to the account number in the group list. To restore an account back to active status, select the account to edit. Then click the icon in toolbar. Next to each group name, a small icon illustrates when the schedule was last updated. See the Tools & Icons section above for a post-date icon summary. If a number appears next to the icon, it represents the number of days since the schedule was last updated. Click a post-date icon to download a group's schedule. You may assign accounts to individual switchboard operators to give them special privileges when accessing the central daily list. Designated staff who log into Amion via a switchboard password can view hidden contact information (e.g. staff cell and home tel numbers, email addresses, etc. ), access page/text message logs, send blast/code pages, append notes to the central display, submit pass-offs, and manage after-hour schedule changes. Click the to add a new group. Enter "Switchboard" in the Group field. Enter a login password. This is similar to the admin password for a group schedule. It is the 2nd half of the full password. The first half is the site's viewing password. For example, if the site password is 'site' and the switchboard login password is 'swi', then the switchboard user enters 'site swi' to login at Amion. Repeat steps 1-4 to add additional switchboard accounts. Designated switchboard accounts have a icon next to the group name. Software Options allows you to tailor the online display to your needs. The options selected below are most commonly enabled by our enterprise customers. 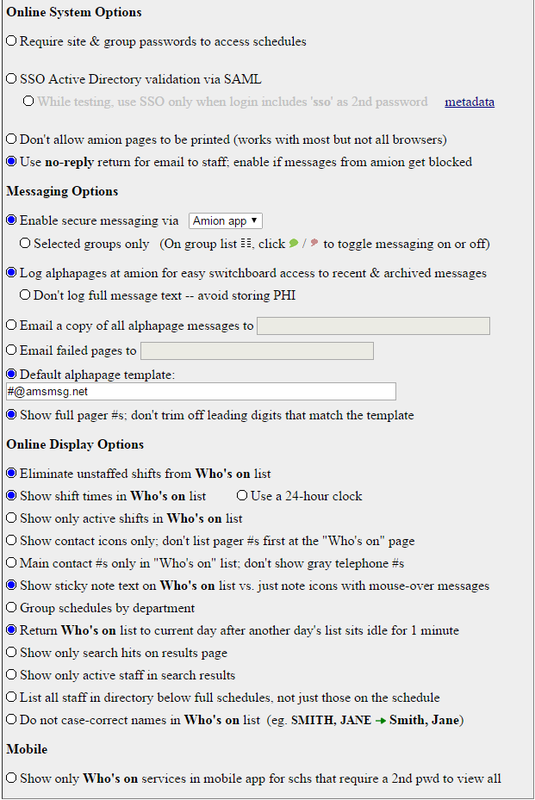 NOTE: The default alphapage template option allows you to enable paging at Amion. Enter your pager carrier's domain in the field provided. For example, the paging domain entered in this field below is for American Messaging pagers. For additional pager carrier domains, contact Amion support. The emailer lets you communicate with schedulers. Use it to help people get started with OnCall, email passwords, and more. Email sent via the emailer uses the enterprise administrator's name and email address in the "from" field. Amion schedules are built and maintained in our desktop app, OnCall. Click here for OnCall's system requirements. Only schedule admins need access to OnCall. We recommend that you install OnCall on a shared network type environment. Each scheduler gets a desktop icon that points to the network copy. Each scheduler will have his/her own schedule files with the extension .sch. Schedule files should always be clearly labeled by department (e.g. Cardioatt.sch) and should be stored on the shared network drive and backed up regularly. Check out our Network Installation help page for more information, or contact support@amion.com. If you choose to have each scheduler install OnCall on their local desktop, you can send the download and installation instructions via the emailer that's part of the administrator login.